Greetings from the staff of Gateway to the Copper Corridor Magazine. This edition is geared toward providing a handy guide to winter visitors for a wide range of events and activities taking place from the San Carlos Reservation to the eastern settlements of the metropolitan Phoenix area—the Valley to those of us lucky enough to live in the mountains to the east. We are fortunate to once again feature the photography of Diane Drobka, an avid photographer who enjoys travel, birding and capturing images of wildlife, scenery and friends on her hiking forays into the desert. Drobka is the publicity chair of the Graham County Historical Society and is retired from the Bureau of Land Management. Her photo—as well as her editorial skills—also appears in Off-Roading at Hot Wells Dunes on page 30. This edition is geared toward providing a handy guide to winter visitors for a wide range of events and activities taking place from the San Carlos Reservation to the eastern settlements of the metropolitan Phoenix area. to Lucas Fendley for his photographic contribution. From Apache Junction, Krysta Paffrath provided images from the Lost Dutchman Rodeo and Heidi Geldis-Young of the AJ Chamber pitched in as well. Staff writer Susanne Jerome, writes about the San Carlos Apache Culture Center Museum on page 27, and award-winning journalist Carol Broeder offers a preview of Pioneer Days in Kearny on page 12. David Abbott will take our readers on a journey into the Sonoran Desert on the Cottonwood Trail near Roosevelt on page 19. 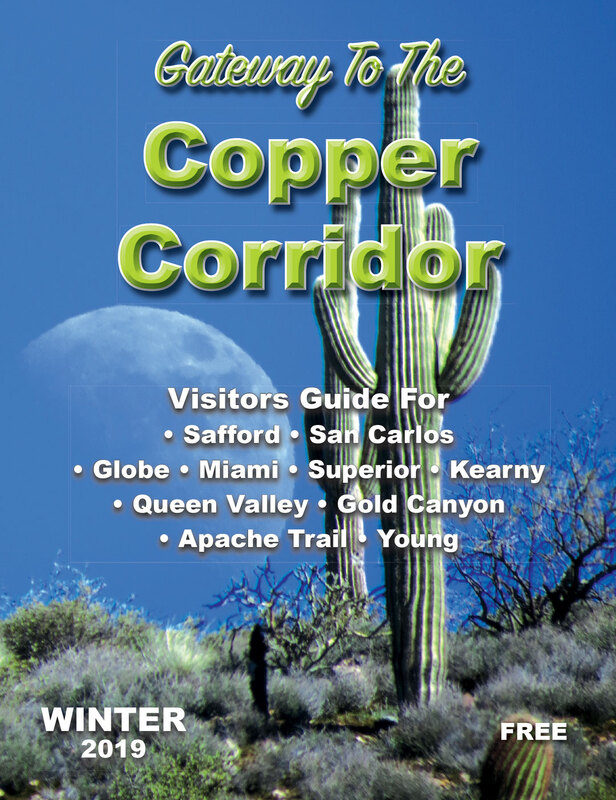 Other highlights found in the pages of Gateway to the Copper Corridor include Superior’s Apache Leap Mining Festival; the Deadliest Shootout in Arizona history; Globe’s Historic Home & Building Tour; “Aristocats Kids,” and many other hidden gems of the Copper Corridor. Welcome to all our visitors from out of state, and those from other parts of Arizona. We hope you find activities to fit your tastes and enjoy your visit to beautiful central Arizona and the Sonoran Desert.